He inspires with fitness and wisdom. For George Jedenoff, skiing is a way of life. He skis Alta’s slopes every day when he’s in Utah. He charges down steep groomed slopes, but he loves to tear up powder. He can do it at 101 years of age because he keeps himself fit. He does a 45 minute workout every day before breakfast. “I know I’ve got to stay in shape or I won’t be able to ski,” he says. Staying fit for life is a lesson we all might learn from him. 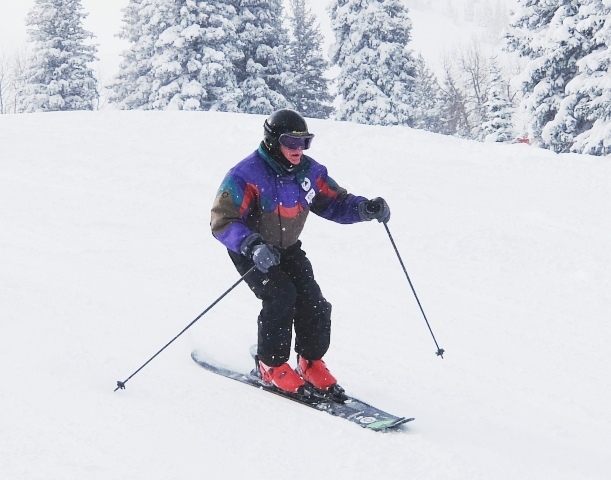 George was 43 when he learned to ski — not exactly a spring chicken. 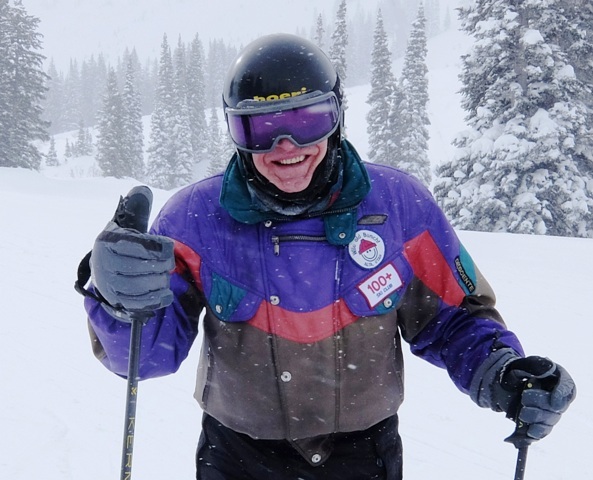 He was athletic, so he decided to try skiing after he came to Utah to be the general manager of the Geneva Steel Plant, the largest steel plant west of the Mississippi. He learned from the best: Alta’s legendary Alf Engen, ski pioneer Junior Bonous, and Earl Miller, the granddaddy of release bindings. “While buying my first pair of skis in Orem, I ran into Earl Miller who offered to teach me how to ski. Of course I used Miller bindings – the only safe bindings available at that time. We used the rope tow at Alta Lodge for my first lesson,” he said. But George learned quickly, and he fell in love with the sport, the scenery, the fresh mountain air, and especially the powder. When he was transferred away, community leaders gave him a gift to lure him back — a Lifetime Season Pass to Alta. He’s still using it! He bursts with enthusiasm for snow and for life. I recently rode the chairlift with George, and I asked for his advice. “You don’t have to be good, you just have to live long enough,” he quipped. We can learn a lot from this patriarch of the powder. He’s a role model for skiers or all ages. Ski Utah makes a video of George every year when he returns to ski. Click here to view last year’s video of George when he was 100.